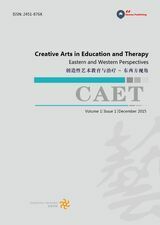 Creative Arts in Education and Therapy (CAET) – Eastern and Western Perspectives is an international journal for artists, educators and therapists, who use and integrate creative arts in their work. The focus is on reporting and discussing perspectives, theory based application and practical results between the West and the East - particularly China and its neighboring cultures. The journal supports cross-disciplinary dialogue, cooperation and research between creative arts (creative writing, dance/movement, drama, film, music, and the visual arts) and education, therapy, psychology, medicine, and other related fields. CAET invites research articles, case reports, program descriptions, position papers, interviews, and conference reports relevant to the field. We also welcome books for review consideration. Manuscripts are subject to a peer review process before being accepted and published. Contributions are to be in English and will be published with bilingual abstracts: English and Chinese. CAET publishes 2 issues per year in both print and online versions. Submission of a manuscript implies: that the work described has not been published before, and that it is not under consideration for publication anywhere else; that its publication has been approved by all co-authors, if any, as well as by the responsible authorities-tacitly or explicitly- at the institute where the work has been carried out. The publisher will not be held legally responsible should there be any claims for compensation. Authors, when quoting from someone else's work or when considering reproducing figures or table from a book or journal article, should make sure that they are not infringing a copyright. Although in general authors may quote from other published works, they should obtain permission from the holder of the copyright if they wish to make substantial extracts or to reproduce tables, plates or other figures. If the copyright holder is not the author of the quoted or reproduced material, it is recommended that the permission of the author should also be sought. Material in unpublished letters and manuscripts is also protected and must not be published unless permission has been obtained. Submission of a paper will be interpreted as a statement that the author has obtained all the necessary permission. A suitable acknowledgement of any borrowed material must always be made. The submitted articles need to serve the aims and scope of the journal. They should have 4,000-6,000 words (including references). Extra pages will incur additional charges. Manuscripts are required to be written in English, and must conform to accepted standards of technically written English. Either US or UK English is acceptable as long as usage is consistent throughout. The publishers are not responsible for correcting errors in grammar or spelling. Articles requiring extensive English revisions may be rejected without review or referred to a professional copy editing service before acceptance. Use of an editing service is neither a requirement nor a guarantee of acceptance for publication. In general, the journal follows the recommendations of the 2009 Publication Manual of the American Psychological Association (APA, Sixth Edition), and it is suggested that contributors refer to this publication. Manuscripts should be typed double-spaced, and using generous margins on all sides. Number all pages consecutively with Arabic numerals, with the title page being page 1. Illustrations (photographs, drawings, diagrams, and charts) are to be numbered consecutively with Arabic numerals and cited in numerical order in the text. Photographs should be high-contrast and drawings should be dark, sharp, and clear. Each figure should be provided on a separate page and should have an accompanying caption. The captions for illustrations should be listed on a separate page. Headings should be formatted following APA guidelines. Use no more than three levels of displayed headings. Abbreviations should be written out and defined at first mention and then used consistently thereafter, except when beginning or ending a sentence. Footnotes should be avoided. When their use is absolutely necessary, footnotes should be numbered consecutively using Arabic numerals and typed at the bottom of the page to which they refer. Place a line above the footnote, so that it is set off from the text. Use the appropriate superscript numeral for citation in the text. Keywords: up to five keywords. The use of first persons (i.e., "I", "we", "their", possessives, etc.) should be avoided, and can preferably be expressed by the passive voice or other ways. This also applies to the Abstract. If presenting an article describing experimental research: Include introduction, elaboration of the theory/methods etc., results/discussion, and conclusion divided by subheadings. Please include short text (max 200 words) of author biography which will be included in the online version of CAET. This is a good way of promotion of your work to the academic world. The Funding Acknowledgements can be included there is any, with the research project name, fund number and funding organization (max 100 words). Berrol, C. F., Ooi, W. L., & Katz, S. S. (1997). Dance/movement therapy with older adults who have sustained neurological insult: A demonstration project. American Journal of Dance Therapy, 19, 135–160. Shapiro, K. J. (1985). Bodily reflective modes: A phenomenological method for psychology. Durham, NC: Duke University Press. Goodill, S. W., & Cruz, R. F. (2004). Single-subject designs in clinical dance/movement therapy research. In R. F. Cruz (Ed. ), Dance/movement therapists in action: A working guide to research options (pp. 92–108). Springfield, IL: Charles C Thomas Publisher. In order to facilitate masked (previously termed "double-blind") review, leave all identifying information off the manuscript, including the title page and the electronic file name. Appropriate identifying information is attached automatically to the electronic file. Upon initial submission, the title page should include only the title of the article. An additional title page should be uploaded as a separate submission. Note: please do check and correct your paper carefully when proofs are sent to you. Corrected papers will be directly published by the journal publication office and no further correction is possible.